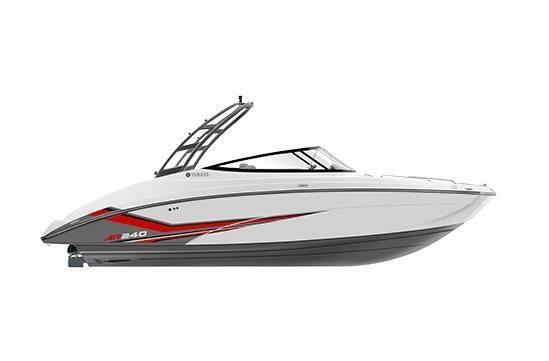 2019 Yamaha AR240 powered by Twin 1.8L High Output 180hp each Yamaha Marine Engines. Features Include: Forward Folding Wakeboard Tower, Full Length Keel, Articulated Keel and Rudder System, Connext Touchscreen with Navigation and Information System, Snap in Woven Flooring, Twin Reclining Captain's Chairs, Head Compartment, Hinged Seats, Polk Audio with Transom Remote, Bow Ladder and Anchor Storage, Removable Cooler, Dual Batteries with Switch, Cruise Assist, No Wake Mode, Portside Glove Box, Recessed Cleats, Tandem Axle Shoreland'r Trailer with Brakes, LED Lights, Swing Tongue, Retracting Tie Down Straps. Sale Price does not include freight and dealer prep.